GEI Works manufactures floating booms and barriers that are the perfect containment solution for any location dealing with displaced silt, turbidity, sediment, oil, or debris. Designed to quickly control spills, erosion, or construction remains, these barriers help keep sites in compliance by containing and preventing the spread of pollution. Please feel free to browse through our USA made boom barriers below to find the right floating boom or barrier for your location or containment application. The Orion Floating Debris Boom is a multi-purpose barrier designed to contain pollutants in a water body. The most popular use for Orion debris booms is to limit the spread of trash, plastic, and debris by containing it to a designated area. As a boom manufacturer, GEI Works is committed to designing products that work. We will work with you to produce the best boom barrier for your specific location. Whether at a large job site, or for shoreline seaweed protection, Orion floating booms are versatile enought to suit your need. Effective boom anchoring methods depend on your specific site conditions. For further information, click here to view our Boom Applications and Configurations PDF. For more information on our debris boom barriers, view our Floating Boom for debris. Triton Floating Silt & Turbidity Barriers are a favorite for construction sites or repair areas looking to control displaced or unwanted sediment in or around a water body. Often used as part of a pollution prevention plan, silt curtains help sites maintain compliance with local and federal regulations. Triton floating silt curtains are frequently used during dredging projects, bridge repair, general construction and pile driving. We realize that every water body and job site is unique, so we manufacture a wide range of floating silt and turbidity barriers to accomodate your needs. As a boom and barrier manufacturer we can custom build any curtain to your requirements. Type 1 Floating Silt Barrier Curtain: Intended for calm water areas such as small ponds, canals, and swales. Type 2 Floating Silt Barrier Curtain: For moving water conditions with projects such as dredging, pile driving, and river/lake construction areas. Type 3 Floating Silt Barrier Curtain: Designed for demanding jobs, multiple deployment, or rough water area conditions. Turbidity barriers are chosen based on several area specific conditions including water velocity, wind speed, wave frequency and height, type of sediment, and duration of your project. Check out our Curtain Selection Guide, call our team at 1-772-646-0597 for assistance or submit your specs. 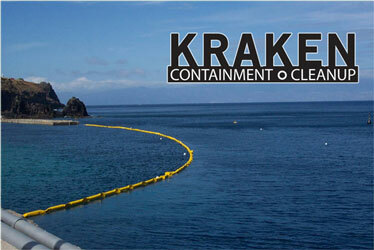 The Kraken Oil Containment Boom is one of the strongest and most reliable options for areas dealing with a hazardous material leak or spill. Designed with highly rated fabrics, components and materials, these floating booms are well equipped to handle the demands of oil containment. The Water Baffle System is designed as a system of floating curtains that can be used to control the Biological Oxygen Demand (BOD) and lower the amount of Total Suspended Solids (TSS) that is currently in your water area. Their effective and economical design has allowed them to be used in a variety of waste water management and water pollution control applications. Read our blog post here and learn how floating barrier fit into a disaster preparedness plan. GEI Works is a proud USA based boom barrier manufacturer. GEI Works is a US based manufacturer of floating barriers such as silt curtains, trash booms, and oil booms in the USA.